On July 1, a fare increased approved by the agency’s Board of Directors in 2007 is scheduled to go into effect. A single ride on most Metro buses or trains will increase from $1.25 to $1.50 and the cost of a day pass will rise from $5 to $6, among other changes. Fares for students, seniors and the disabled will remain frozen until July 1, 2013. 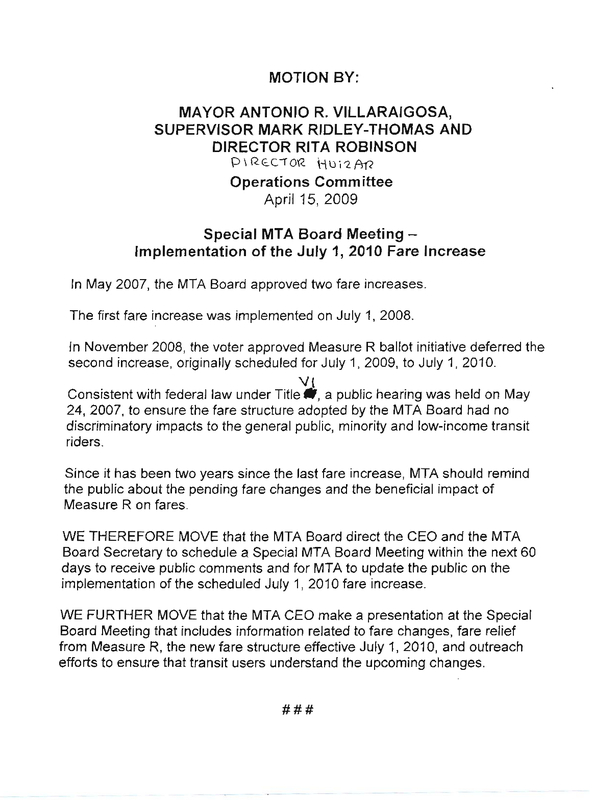 The increase was originally scheduled for July 1 of last year but a one-year delay to the fare change was part of the Measure R sales tax increase approved by voters in Nov. 2008. So was freezing fares for students, seniors and the disabled. In recent meetings of the agency’s Board of Directors some members of the public — and, in particular, the Bus Riders Union — have complained that it’s unfair to increase fares during a recession. There has been no indication that the Board of Directors will delay or rescind the scheduled increases, but four members of the Board of Directors signed a motion on Thursday to hold a special meeting to discuss them. The motion’s language doesn’t indicate that those who signed it — L.A. Mayor Antonio Villaraigosa, Supervisor Mark Ridley-Thomas, LADOT Rita Robinson and Los Angeles Councilman Jose Huizar — intend to roll back the increase. The decision whether to hold the special meeting will be made by the full Board of Directors at their meeting on Thursday, April 22.